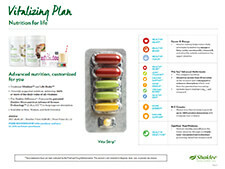 Get healthier and more energized with Vitalizing Plan! Includes the protein-rich Life Shake and Vitalizer, giving you the essential vitamins and minerals your body needs along with the benefits of a delicious all-in-one meal. Includes 30 servings of a non-GMO protein shake in your choice of plant or soy, and a Vitalizer multi-supplement Vita-strip. Vitalizer is based on 12 clinical studies and the Landmark Study, one of the largest studies ever done on long-term supplement users. Get healthier and more energized with Vitalizing Plan. Includes protein-rich Life Shake and Vitalizer™, giving you the essential vitamins and minerals your body needs along with the benefits of a delicious, 20 gram protein, all-in-one meal. The plan includes 30 servings of a non-GMO protein shake in your choice of plant or soy and a daily Vitalizer supplement strip. Increase energy and keep you feeling fuller longer with 20g of ultra-pure non- GMO protein. Achieve a healthier weight with a leucine powered formula to help you build lean muscle, burn fat and improve metabolism. Provide digestive support with fiber and digestive enzymes. Delivers essential nutrients including vitamins, minerals and omega-3 (ALA) and essential fatty acid. Plant: A blend of non-GMO pea protein, L-Leucine, organic chia seed protein, and organic pumpkin seed protein. Soy: A blend of non-GMO soy protein. Stevia Free: A blend of non-GMO soy protein, L-Leucine, organic chia seed protein, and organic pumpkin seed protein, sweetened with sugar. Provides vitamins, minerals, antioxidants, omega-3s, and healthy probiotics—all in one convenient Vitalizer Vita-Strip®. With formulas designed to meet the needs of men, women and adults over 50. Vita-Lea® Advanced Multivitamin: Dissolves in less than 30 minutes in the stomach, designed to enhance absorption of folic acid from the patented microcoating. B+C Complex: Provides up to 198% greater absorption of B-vitamins over 12 hours, as shown in a clinical study, through sustained release delivery to the small intestine. Caroto-E-Omega: Enteric coating helps reduce fishy aftertaste by delivering omega-3 fatty acids, carotenoids, vitamin E, and other fat soluble nutrients to the upper intestine. Optiflora® Probiotic: Delivers healthy microflora to the lower intestine through our triple-layer encapsulation technology, protecting them from stomach acid. Vitalizer Women: Excellent as a prenatal/postnatal multivitamin. Vitalizer Women provides a full spectrum of nutritional support including 800 mcg of folic acid, 200 mcg of iodine and 18 mg of iron. Vitalizer Men: Comprehensive nutrition with additional lycopene. Vitalizer Gold: Extra B-Vitamins, CoEnzyme Q10, and N-Acetylcysteine. Is based on 12 clinical studies and the Landmark Study, one of the largest studies ever done on long-term supplement users, which showed that Shaklee supplement users had markedly better health than non-supplement users. Uses Shaklee Micronutrient Advanced Release Technology (S.M.A.R.T. ), a unique, patented delivery system designed to improve absorption of key nutrients. The right nutrients, in the right place, at the right time. That's S.M.A.R.T. Take one Life Shake™ and one Vita-Strip® every day. Who should use Life Shake and why? Life Shake is an excellent meal replacement or snack for the entire family. A source of both macro- and micronutrients, Life Shake is designed to provide energy, help preserve lean muscle and achieve a healthier weight, and support digestive, immune, heart, and brain health. What is leucine and why is it an important ingredient? Leucine is the best, most effective branched-chain amino acid used the biosynthesis of proteins. It signals your muscles to stimulate protein synthesis. It helps your body preserve lean muscle mass while you lose weight. Simply put, it helps ensure the weight you lose is fat and not muscle. How much caffeine is in the chocolate Life Shake and café latte Life Shake? The caffeine content is very low, less than 2 mg per serving in both products. I do not like the taste of stevia, what should I do? Please choose the stevia-free formula Life Shake. Can Vitalizer™ Women be used as a pre- and post- natal vitamin? Yes. Vitalizer Women is excellent as a pre and post natal, and is fortified with 800 mcg of folic acid, 18 mg of iron, and 200 mcg of iodine. Children 12 years of age or older may use Vitalizer. What is the Shaklee Landmark Study? Shaklee scientists based the formulation of Vitalizer™ on 12 published Shaklee clinical studies, including a first-of-its-kind Landmark Study. In this groundbreaking study, Shaklee collaborated with researchers from the UC Berkeley School of Public Health to evaluate long-term Shaklee supplement users. The results of that study were published in Nutrition Journal and showed that the people who took Shaklee supplements had markedly better health than non-supplement users. Specifically, the study showed that Shaklee users had 33% lower triglyceride levels, an 11% lower ratio of total cholesterol to HDL cholesterol, nearly 59% lower levels of C-reactive protein, and 36% lower levels of homocysteine—all of which are key biomarkers of current and future health. View the Vitalizing Plan flyer. View the Life Shake Ingedients. View the Life Shake Product Sheet. View the Life Shake Stevia FAQ. Includes protein-rich Life Shake and Vitalizer, giving you the essential vitamins and minerals your body needs along with the benefits of a delicious, all-in-one-meal. 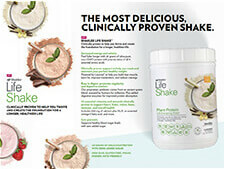 Life Shake, a delicious, convenient clinically proven shake. Provides vitamins, minerals, antioxidants, omega-3s, and healthy probiotics—all in one convenient Vitalizer Vita-Strip™. Customized formulas designed to meet the needs of men, women and adults over 50. Advanced Nutrition, Customized for You.